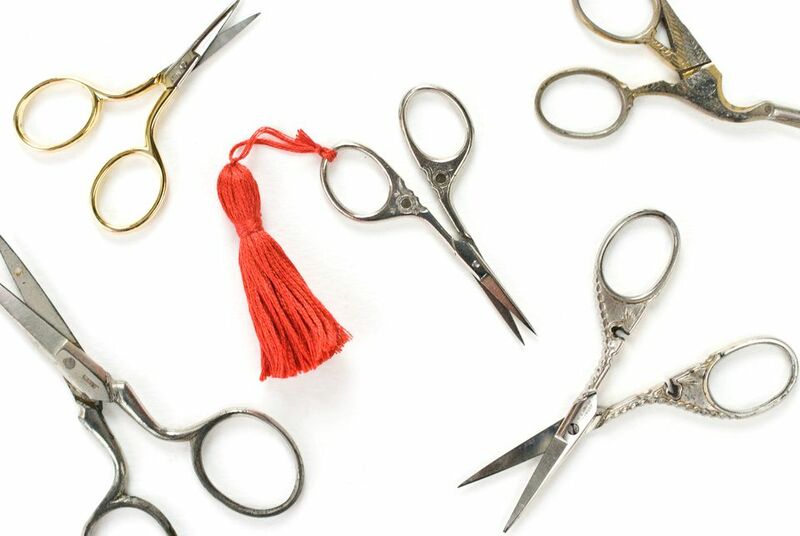 Scissor fobs or charms have been around for a long time, and are often used to distinguish scissors from one another (a problem when a group of stitchers gather!). Even if you only ever embroider by yourself, you'll find that this DIY tassel charm makes a nice addition to your embroidery scissors. One helpful feature of having a fob on your scissors is that it make them easier to find. Have you ever had your little scissors slip between the couch cushions or blend in with the area you're working? A brightly colored tassel is hard to miss! Not to mention, an accessory like this can be an expression of yourself. And it's so fast to make, you might just decide to make several so you can change change up the look of one of your most used embroidery tools. The best part is, you already have all the materials you'll need for this project! Cut off two 8in pieces of embroidery floss and set them aside. Begin wrapping embroidery floss around three fingers held together as shown. Don't wrap it too tight, but try to keep an even tension. Wrap the floss 30-35 times around. TIP: If your embroidery floss has kinks or folds in it from the skein or a bobbin, give it a quick ironing along the whole length so that your tassel will hang nicely. Slide the wrapped thread off your fingers, keeping it as neat as possible. Slip one of the 8in pieces of thread in the wrapped floss and tie it off with a doubled or tripled knot. Make it tight and secure, and try to keep the ends of the thread fairly even. Tie an overhand knot in the two ends of the floss, about 1-1/2 to 2 inches from the top of the tied tassel. Trim the ends. Take the other 8in piece of embroidery floss and wrap it around the tassel about 1/2 inch from the knotted top. Wrap it around several times so it is tight and then tie the ends with a double knot. For extra security, you can add a dab of fabric glue to the knot, but that's optional. Trim the ends close enough that they aren't sticking out, but not so close that you risk the knot coming undone. Slide a sharp pair of sewing scissors through the loops at the bottom of the tassel and cut straight across. Then, trim the ends so they are all even. This gets a little messy, so you may want to do this over a trash can. To use your tassel charm, slip the loop of thread through the handle of your scissors, then bring the tassel through the loop, forming a cow hitch knot. The fob will hold tight to your scissors and add simple charm to your embroidery tool basket. These tassels can be used on other items as well, such as on a zipper pull, or even attached to the button closure on the DIY Project Pouch. They're so fast and easy to make, you might even want to try making a few with some specialty threads, such as metallics, perle cotton, floche, or wool.